All of these quilts are finished with my no-binding QUILTapestry technique. The first three are my Scandinavian Series Quilts and are available as patterns The top border serves dual purpose as a hanging sleeve! The first of the Scandinavian Quilt Series and the first time I tried to finish a quilt with my no-binding technique. Not only is there no binding to attach, the top border does double duty as the hanging sleeve! 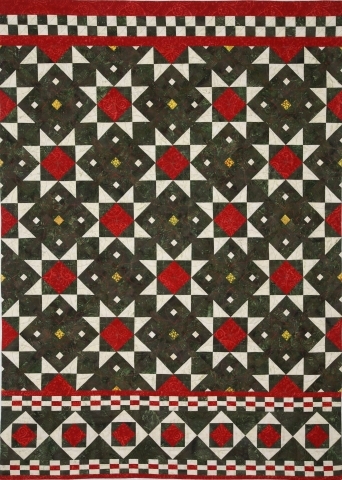 This quilt was inspired by the traditional sweater vests worn by Estonian school boys. This quilt was inspired by the tradioanl patterns and colors of Estonian national folk costumes. My first "Orphan Block Rescue" Quilt using the QUILTapestry technique. My seven year old son designed the applique face for the paper-pieced pumpkin pattern from EQ7. I created this QUILTapestry from a bundle of batik fat quarters that I won in a silent auction and embellished with my machine's built-in embroidery stitches with gold thread.